When seawater enters into the ocean crust, heats and reacts with crustal rock, then rises to the seabed, the columns of emerging fluid and gas is called a hydrothermal vent. Hydrothermal vents dot the Earth's seabeds in volcanically active areas and in zones where tectonic plates are moving apart. Marine biologists study the unique chemosynthetic biological communities living around vents. Some hypothesize that hydrothermal vents produced the organic molecules needed for life. A recent study by chemists at University College London reports that the chemical properties found on the surfaces inside hydrothermal vents are similar to enzymes. Enzymes /ˈɛnzaɪmz/ are macromolecular biological catalysts. Enzymes accelerate, or catalyze, chemical reactions. Enzymes are biological catalysts that govern chemical reactions in living organisms. Hydrothermal vents would therefore be capable of spontaneously producing carbon-based molecules like methanol and formic acid from the carbon dioxide dissolved in the emerging water. "There is a lot of speculation that hydrothermal vents could be the location where life on Earth began. There is a lot of CO2 dissolved in the water, which could provide the carbon that the chemistry of living organisms is based on, and there is plenty of energy, because the water is hot and turbulent. What our research proves is that these vents also have the chemical properties that encourage these molecules to recombine into molecules usually associated with living organisms." 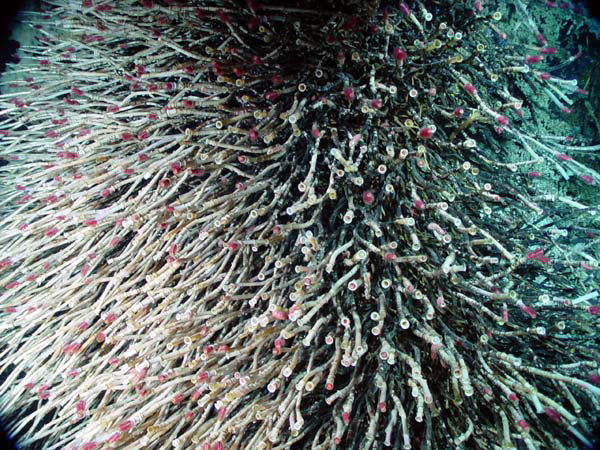 Invertebrate tubeworms covering a sulfide chimney called Zooarium. Earth-Ocean Interactions, NOAA/PMEL Vents Program. Eruptive Discoveries, by Bill Chadwick, Pacific Marine Environmental Laboratory, NOAA, 29 April 2002. Hydrothermal Venting, NOAA/PMEL Vents Program. Major known deep-sea hydrothermal vent fields. Origin of life: Chemistry of seabed's hot vents could explain emergence of life, University College London, ScienceDaily, 27 April 2015.